I can not believe I have been changing nappies for over 8 years. In that time I have changed in excess of 18000 nappies for Grayson alone. I have come to think of myself as a little of a nappy expert. We have used nearly every brand on the market at one time or another. Plus some which aren't. I've used everything from newborn to pull-ups and all in between. 1. They cost a small fortune, we all can't wait for that saving on our food shopping bill each week once they are potty trained. 2. The cheapest nappies are not always too good but at the same time the most expensive are not always the best. 3. Do buy what works for each child individually. No matter the cost. 4. Buy in bulk, it does save money. 5. You will at one point always run out of nappies and have to use a towel, tissue, something that works whilst you get to a shop. Grayson thankfully is funded 70% of his daily nappy usage from the NHS. But that means the other 30% is funded by us, now considering he uses roughly 2500 nappies a year, that is a lot of nappies we have to buy. When we never thought we would be. Up until a year ago it was not too much of a problem, Grayson is quite tiny compared to an average 8 year old so I would head and buy 6+ Little Angels nappies (by far my favourite brand). But then as he grew and gained weight that was no longer an option. So I headed to an incontinence website and found the nappies Grayson has from the NHS. It all was very easy until I saw the cost and worked out how much that extra 30% would be, over £400 a year. 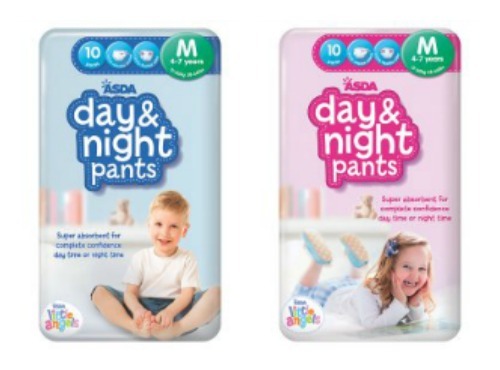 That's when Asda kindly agreed to send me some of their new Day & Night Pants. Aimed at children who still need something to help build their confidence as they learn to stay dry, actually quite a normal occurrence in children going into to school age. They wondered if the Day and Night pants could work for children like Grayson. What a lot of people don't realise is not all disabled children are funded nappies from the NHS, so not only was I happy to test them for Grayson, but I wanted to see how they would for children in our network who are trying to make the transition to potty training just at an older age. The first thing I noticed was how the Pants had the usual Little Angels quality I have come to love. Some cheaper nappies can feel quite harsh on children's skin, these feel just as their younger nappies do, nice and soft. The elasticity is in all the right places. I have found some pull ups in the past are not very snug around the legs and this can cause them to leak, this is not the case, the Day and Night Pants come with the double flap system. So quality wise they were good, but what about cost ? Would they show me a saving from Grayson's special needs nappies ? Well for the same 30% of nappies I would pay around £290. That's over £100 saving and trust me for us every penny is really needed. I also like the fact I do not have to worry about remembering to order them online, I just have to head to my local Asda. For me Asda could market these to special needs families, I certainly know a few who are using them and are pleased that the option is there, but we have all agreed being in only packs of 10 is not ideal. I understand that this maybe enough for many families who are using them at the later stages of training but I am sure packs of say 30 with a slight bulk discount would still sell just as well and certainly would make it better for families like mine. But either way they will be going in my trolley each week. Do let me know if you give them a try, I would love to know how you get on.